The Indians never got anywhere near first place throughout the 1970s (or 1960s or 1980s). 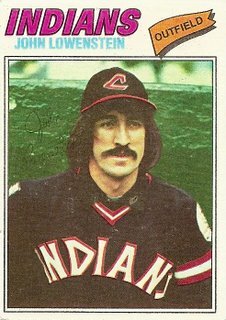 Judging from this John Lowenstein card, the strain of toiling season after season without hope of ever reaching the glittering lights of the playoffs was something the Montana-born Lowenstein was singularly equipped to handle. His westward-trudging pioneer ancestors had probably endured droughts and floods and scurvy and crushing isolation and perhaps even grisly skirmishes with the demographic represented by the huge script across Lowenstein’s chest. Replace the baseball uniform and cap with a dirty white shirt, fraying leather vest, and sagging mud-flecked bowler hat and Lowenstein is an extra in McCabe and Mrs. Miller, staring gauntly at the ceaseless gray drizzle, subsisting on diminishing rations of pemmican and horse oats, waiting uselessly for the shipment of prostitutes who though cheap will all be beyond his dismal means. 1. My God, he looks like a vampire! Growing up in cleveland I was big lowenstein fan. After he was traded and i was in high school, I lost touch with john, but i think he had some pretty good years ex indian and made it to the playoffs with the orioles? Anyway, as a huge stratomatic player john had one of those cards that had him as defensive rating of 4 but almost at every position! Wow I can play Lowenstein full time at 2b????? How cool. What would the 75 indians have been like with lowenstein playing full time at 2b? Interestingly the 75 Indians had the 2nd most homeruns that year, falling just short of Boston I believe. I can alway get them to play better than the 500 season they had. Six positions, B-stealing rating, and 1-16 running stats and Kingman-like HR power (i imagined) against righties made him always valuable player to me. I vaguely remember he was funny in inteviews. He looks like he should be hosting a midnight movie. Hey Josh…..looking closer at at the card you have posted, it looks like you have his autograph on there, upper left corner. I can’t imagine that one day in boston as cleveland came to town you were drapped over the railing clamoring to get steiner’s graph???? I imagine that you were at the age where you were already nostalgic over the 75 set where the colorful cards were autographed and you decided to sign john’s name. Please, take me back to the day when you met steiner or decided to be stenier!! The McCabe and Mrs Miller comparison is excellent!